I like to think of this cocktail as a drinkable lemon drop poke cake because that's exactly what it tastes like, a yellow cake infused with a Lemon Drop Martini. 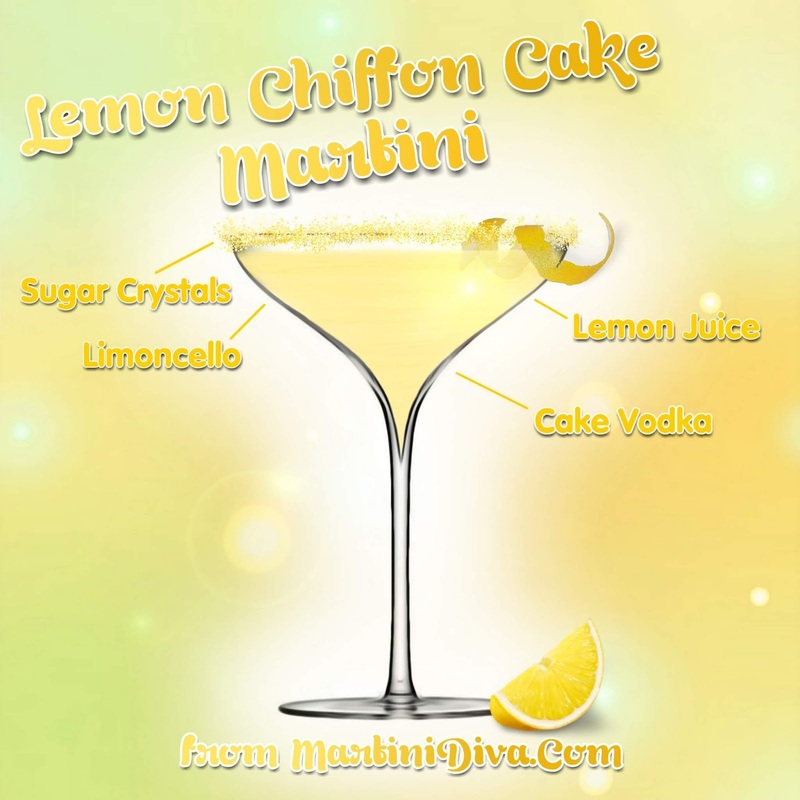 The whole key is, of course, the cake vodka, you can't substitute that ingredient because it tastes and smells just like yellow cake batter. Shake ingredients with ice until chilled. Strain into a chilled glass, Garnish and serve. National Lemon Chiffon Cake Day is March 29th. This week's topic - Flavored Vodkas! Like 'em? Hate 'em? Favorites? BYOB & be ready to party! Spring is when all those big, juicy California strawberries start showing up in our local farmer's markets & grocers. I'm especially fond of the giant strawberries that grow around Watsonville and in central California. Strawberries the size of a child's fist with long stems that are perfect for dipping in chocolate or for making a cocktail! Strawberries have many health benefits that are great for a body coming out of a long winter. My mom used to say that they were great for "cleaning out the blood" and I guess that wasn't so far off the truth as a study from the Harvard Medical School found that strawberries may offer heart disease protection! All I know is they taste great! 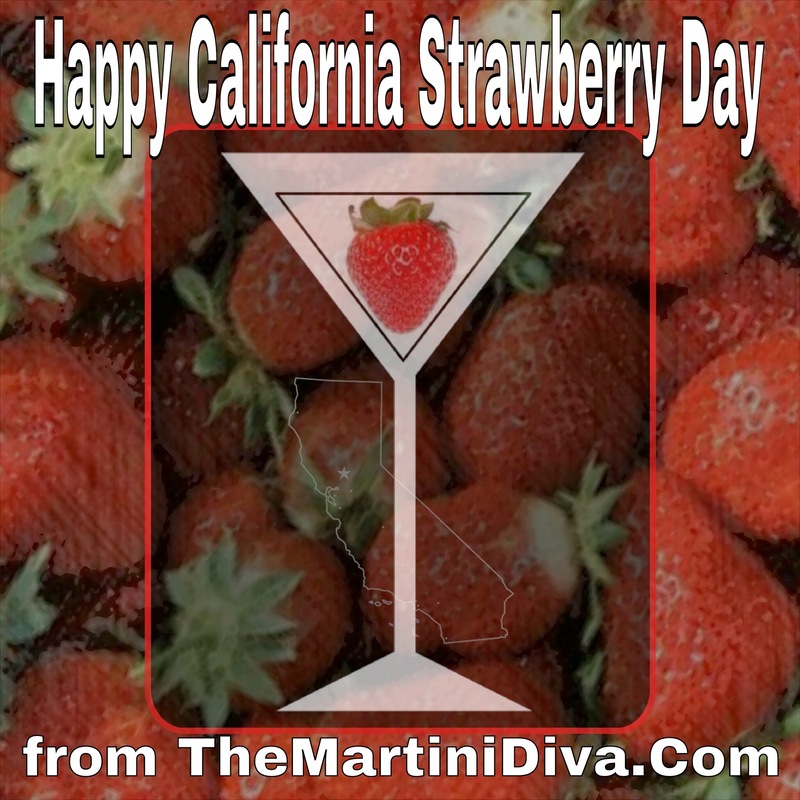 Whether dipped in chocolate, eaten as is, made into desserts or turned into the star of a delicious Strawberry Cocktail! MARTINIS for the 1st DAY OF SPRING & the VERNAL EQUINOX! Yes, I know it doesn't seem like it in a lot of the U.S. right now (in fact, here in Arizona it's not getting over 60 when it's usually around 75 - 85! ), but it really is the first day of Spring! The astronomical spring begins today and ends Tuesday, June 19th at midnight. Also known as the Vernal Equinox, the first day of Spring is equal parts day and night! The word equinox is derived from the Latin word equinoxium "equality of night (and day)". The spring and fall equinoxes are the only dates with equal daylight and dark as the Sun crosses the celestial equator. Just Loves me some John McClane! What? A Corned Beef Cocktail?? NO! I did NOT go there, but Top Chef favorite Richard Blais did a few years ago! Taking a dash of corned beef drippings and a splash of cabbage juice, Blais turned a Whiskey Collins into a unique St.Patrick's Day tipple. With a little bit of leprechaun humor and a bit of Blarney - not to mention a bit of Blais' trademark molecular gastronomy - here is his CORNED BEEF COLLINS. THE NUTTY IRISH MARTINI MOUSSE! This is what I'll be having for dessert with my corned beef and cabbage tomorrow! It's a light and flavorful nut infused mousse with booze because no self respecting Irishwoman (or man) could possibly serve up a dessert without some alcohol in it! 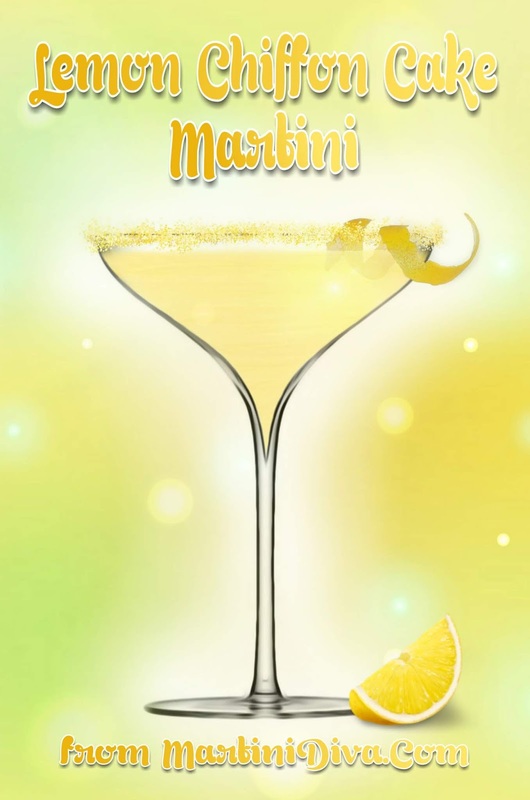 Spring is coming, it's time for some Flower Martinis! I was recently sent some lovely jars of hibiscus flowers packed in syrup from Wild Hibiscus for creating some new and unique cocktails. Edible flowers are all the rage in the culinary world at the moment, though floral flavors are nothing new to the world of food or drink. The Bible mentions dandelions as one of the "bitter herbs", the Romans used mallows, roses and violets often in their dishes, teas have been infused with flowers for thousands of years, and the Victorian era was big on fresh flowers in salads. The resurgence of the popularity of flowers as food* has opened up a surge of creativity in the garnishing and flavoring of cocktails, bringing a whole new bouquet of bounty to happy hour. 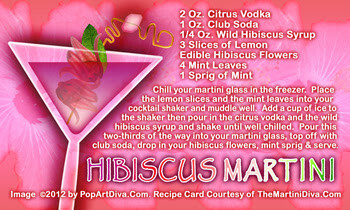 In my Hibiscus Martini I have used the unique tartness of the flower to bring a subtle floral flavor to a citrus cocktail. I also used the hibiscus syrup in place of simple syrup, bringing even more flavor and adding a burst of magenta color! *Not all flowers species are edible and not all edible flowers are "food quality". Here's a great list of Edible Flowers from Epicurian.com and here's a good article from Chef's Blade on How to find and use edible flowers. 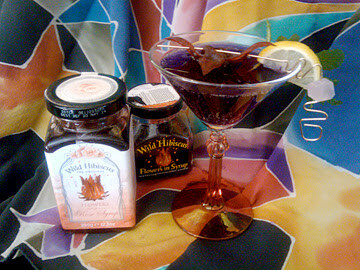 Purchase the WILD HIBISCUS MARTINI RECIPE Here. 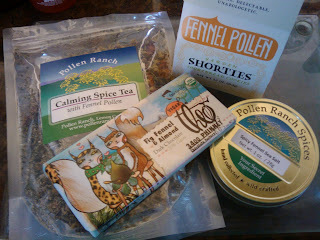 Pollen Ranch sent me a bag of their Calming Spice Tea, a package of their FREAKIN' DELISH Shortbread Cookies (which may never make it to a martini! ), A bar of their Fig Fennel & Almond Chocolate (which also came close to never making it into a martini) and a tin of their Spicy Fennel Sea Salt. *First you must make the fig liqueur. Yes, you can buy Fig Liqueur and there are 3 that I'm aware of: Edmond Briottet Creme de Figue, Briottet Creme de Figue and Boukha Fig Liqueur, but if you can make if for less than upwards of $30 a bottle why wouldn't you? The easiest way to do this is to get 8 ounces of dried figs and infuse these into vodka. I added about 1/8 a cup of sugar to mine but dried figs are very sweet so it's not necessary. You can get the instructions for making vodka infusions at TheMartiniDiva.Com's Fun page article "How to Make Flavor Infused Vodka". You will need at least a week to infuse the fig liqueur. Next you are going to make a chocolate fig candy by melting the Pollen Ranch chocolate bar, dropping in the 1/4 cup (+/-) of dried fig pieces, then spooning the mixture into candy molds. This will be your garnish. I placed my chocolate onto the tines of a cocktail fork and used this to stir my martini occasionally, adding a little more a deep chocolate flavor. I then had a nice little chocolate tidbit to pop in my mouth after I finished the martini! 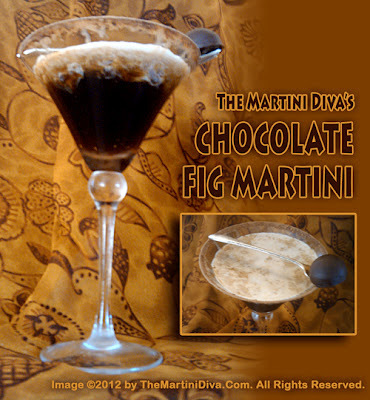 Prepare your martini glass by dipping first in some of the Creme de Cacao then into the cocoa powder and chill this in the freezer. Then pour the Fig Liqueur and the Dark Creme de Cacao over a cup of ice in a cocktail shaker, add the 1/4 Tsp of Pollen Ranch Spicy Fennel Sea Salt and shake until well chilled. Pour this almost to the top of a chilled martini glass then slowly drizzle the heavy cream over the top for a marbled effect. Sprinkle on a bit more of the Spicy Fennel Sea Salt and sit back and enjoy! Happy National Banana Cream Pie Day! What's Better Than a Banana Cream Pie in The Face? 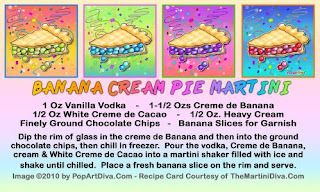 A Banana Cream Pie in your Martini Glass! 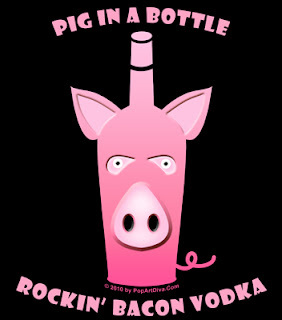 Happy National Pig Day - PUT SOME PIG IN A BOTTLE! Put Some PIG in a Bottle! 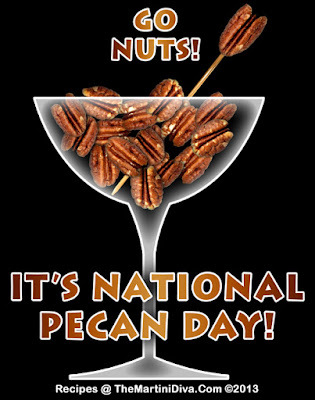 Happy National Peanut Butter Lover's Day! Peanut Butter Lovers Rejoice for Today is the National Peanut Butter Lover's Day! 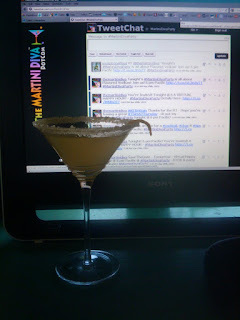 What's the nicest thing about Peanut Butter Martinis? They don't stick to the roof of your mouth! You might also be interested in knowing that Van Gogh Vodka will be releasing their PB&J Vodka at the end of March - a peanut butter and (raspberry) jelly flavored spirit set to temp the peanut butter lover for happy hour! I would love to get my hands on a bottle of this to see if they actually managed to capture the essence of a peanut butter and jelly sandwich!